William Henry Sparks was born in Yeovil in 1888, the son of shop fitter Charles Sparks (b 1863), originally from Hemyock, Devon, and his Yeovil-born wife Catherine Bollen Batty née Hayward (b 1858). The nature of Charles' job meant that the family moved around and the 1891 census recorded them in Hammersmith, London. By the time of the 1901 census 13-year old William was living with his 84-year old grandmother Parthenia Hayward in Corfe Mullen, Dorset. William enlisted in the army at Winchester, at the age of 18 - his Service Number 7697 indicating that he enlisted in September 1906 in the 1st (Regular) Battalion of the Hampshire Regiment. In 1907 the Battalion were stationed in Londonderry, Northern Ireland, returning to Aldershot in 1910, transferring to Colchester, Essex, in 1913 which transferred them from the 2nd Division to the 4th Division. On 17 August the Special Reserve was at its coastal duties, the Territorials were also mobilized and were taking over their stations. This relieved the 4th Division from its temporary role as spearhead of the Home Defence Force duties. The 4th Division could now follow the rest of the British Expeditionary Force (BEF) overseas. On 21 - 22 August the 1st Battalion loaded on to their ships at Southampton the right wing on the Braemar Castle, the left wing along with the Rifle Brigade on the Cestrian, and headed for Le Havre, France. When the 1st Battalion arrived the BEF was already in contact with the Germans at Mons. The 1st Hampshire detrained at Le Cateau, and almost immediately entered a series of battles. The Battle of Le Cateau was fought on 26 August 1914, after the British and French retreated from the Battle of Mons and had set up defensive positions in a fighting withdrawal against the German advance at Le Cateau. On the morning of 26 August, the Germans arrived and heavily attacked the British forces. Unlike the Battle of Mons, where the majority of casualties inflicted by the British were from rifle fire, Le Cateau was an artilleryman's battle, demonstrating the devastating results which modern quick-firing artillery using airbursting shrapnel shells could have on infantry advancing in the open. Holding their ground tenaciously against superior odds despite taking heavy casualties, by mid-afternoon, the right, then left flanks of the British, began to break under unrelenting pressure from the Germans. That night, the Allies withdrew to Saint-Quentin. Of the 40,000 British troops fighting at Le Cateau, 7,812 British casualties were incurred, including 2,600 taken prisoner. The First Battle of the Marne, fought from 5 to 12 September 1914, resulted in an Allied victory against the German Army. The battle was the culmination of the German advance into France and pursuit of the Allied armies which followed the Battle of the Frontiers in August, which had reached the outskirts of Paris. The counterattack of six French field armies and the BEF along the Marne River forced the German Imperial Army to abandon its push on Paris and retreat north-east, leading to the 'Race to the Sea' and setting the stage for four years of trench warfare on the Western Front. The Battle of the Marne was an immense strategic victory for the Allies, wrecking Germany's bid for a swift victory over France and forcing it into a drawn-out two-front war. These were the last major engagements seen by the 1st Battalion Hampshire Regiment during 1914. 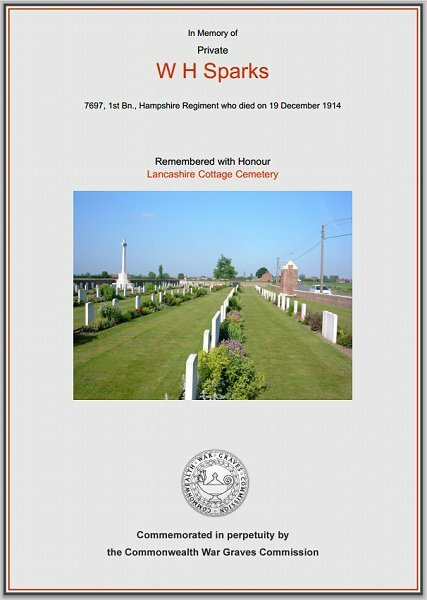 Sadly, however, on 19 December 1914 William Sparks was killed during day-to-day fighting. He was 26 years old. 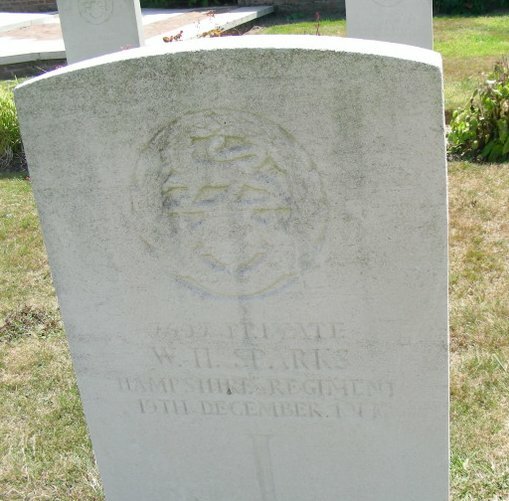 William Sparks is interred in Grave II.D.3, Lancashire Cottage Cemetery, Comines-Warneton, Belgium. His name was added to the War Memorial in the Borough in 2018. The Commonwealth War Graves Commission certificate in memory of William Sparks.